Problem This customer was using DC generators and variable speed motors to pump liquid oxygen from their delivery vehicle into their customers' storage tanks. That scenario was proving far too costly to maintain, prompting them to seek an alternate delivery method. Solution A Nexen M-800 clutch was mounted on a power takeoff from the tank truck's engine. 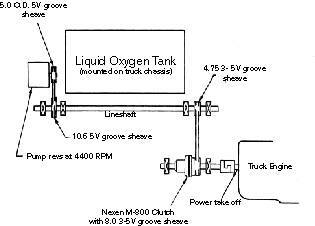 The oxygen pump requires 17-18 hp to operate effectively. The power takeoff easily meets that, developing up to 26 hp at 1200 RPM. Clutch control is from the rear of the truck where there is also a dual throttle control for "revving up" after engagement of the clutch. Four conversions over to the new process took place immediately and others soon followed. The best store builder by ShopFactory powers D396. All-in one store builder and eCommerce software.